This equipment set from Forster America comes with all of the tools needed for universal manufacturing. (6x) Clamping Arm 30 mm – Clamping Arm 30 mm (1.2 in). Steel finish, chromated. With sliding and pivoting clamping element. Pad 30 mm (1.2 in) with V-pad in steel finish. (4x) Flat Clamp – Flat Clamp 305 x 350 mm (13.7 x 13.7 in), chromated, adjustable. For holding flat components tightly in position. Throat depth 200 mm (7.8 in). Max. Clamping height 110 mm (4.3 in). Steel finish, chromated. (3x) Edge Angle Height 70 mm – Right-angle bracket 70 mm (2.7 in). For straight and right-angle positioning of components along the edge of the table. Clamping side slightly chamfered for secure fitting. Chromated, with screw top. 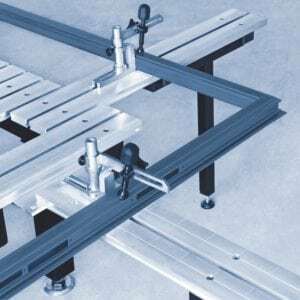 (2x) Edge Angle Height 200 mm – Right-angle bracket, 200 mm (7.9 in), for straight and right-angle positioning of components along the edge of the table. Clamping side slightly chamfered for secure fitting. Chromated. With screw stop. (6x) Flat Stop – Flat Stop 170 x 40 x 20 mm (6.7 x 1.6 x 0.8 in). Chromated steel, with locking screw. (2x) Double T-Slot Profile 1.200 mm with 2 screws and 2 T-Nuts for assemblage on Try-Square – Double T-Slot Profile made out of high-strength F37 aluminum alloy. All Forster clamping elements and stops can be fastened in its standard 14 mm T-slot to use as an attachment for right-angle brackets as well as for building stop walls for 3-D sheet metal constructions. The profiles can be shifted and locked on 2 axes at the same time using the special connecting elements. Simple connectors and connectors for biaxial shifting are available as accessories. (4x) V-Block Support 60 mm – Adjustable V-Block support with steel pad Ã˜ 60 mm (2.3 in). With threaded piece, adjusting screw and T-slot nut. (2x) Clamping Tower 50 x 900 mm – Clamping pole 50 x 900 mm (2 x 35.4 in). Precision steel pipe for continuous 3-D clamping. Freely movable. (2x) Clamping Arm 50 mm – Clamping arm 50 mm (2 in). Chromated steel, complete with sliding and pivoting clamping element (with steel V-pad 60 mm (2 in). 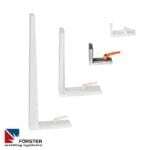 (2x) Support Arm 50 mm – Supporting arm 50 mm (2 in). Steel finish, for continuous 3-D clamping. Freely movable. (4x) Try-Square 100 x 170 mm – Right-angle bracket 100 x 170 mm (4 x 6.7 in). Outer surfaces machined, chromated. With locking screw. For use on table top to securely hold weldments in place. (2x) Try-Square 170 x 170 mm – Right-angle bracket 170 x 170 mm (6.7 x 6.7 in). Outer surfaces machined, chromated. With locking screw. For use on table top to securely hold weldments in place. (2x) Try-Square 600 x 350 mm – Right-angle bracket 600 x 350 mm (23.6 x 13.7 in). Outer and side surfaces machined, chromated, with six threaded holes. Inclusive locking lever. Provides a precise 90º angle surface to securely hold weldments in place.